I’m a faculty member of the Stephen M. Ross School of Business, University of Michigan, with over 15 years of experience researching, teaching, and consulting in the area of value generation with information systems. 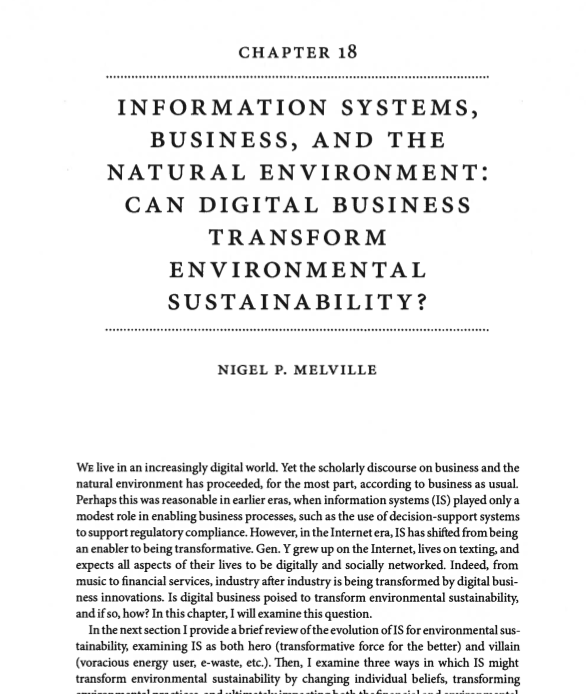 In recent years, I have begun to focus on how corporations use information systems to enhance environmental sustainability performance (e.g., energy reduction and carbon emission management). My articles have appeared in leading academic and professional journals such as Information Systems Research, MIS Quarterly, Decision Support Systems, and Communications of the ACM. I’ve been cited more than 300 times – see the sidebar on the right for recent articles. I’m also an editor of the book Global E-Commerce: Impacts of National Environment and Policy (Cambridge University Press, 2006). I’m currently working on three projects examining adoption, implementation, and business value of information systems for managing corporate energy and carbon emissions. My expertise on energy and carbon management systems has been sought by outlets such as the New York Times, and I have collaborated with the Carbon Disclosure Project. My professional experience includes new product development and research and development with Motorola and co-founding a customer relationship management software company. The common theme was innovative application of information systems to generate new sources of value in organizations, which is the focus of my research. I earned a BS in electrical engineering from UCLA, an MS in electrical and computer engineering from UC Santa Barbara, and a PhD in management from UC Irvine. More on me here. Cool. I’ll keep checking back for updates. Your critical reviews of the industry in the flux is welcome news. I learned about you blog only today after comments you made on another blog. It is interesting to observe how GHG management has grown into a bubble and herd mentality while very little attention has been given to water quality management–a problem that is more challenging to tackle. One of industry’s most vexing impediments in responding to environmental problems has been difficulties in properly centralizing and managing captured water quality data. Thanks for paying attention to the crossroads between technology and environmental management. I’ll be paying regular visits here.